Harness The Power Of Wind To Recharge Your Gadgets | OhGizmo! By Chris Scott Barr on 10/29/08 • Leave a comment! Over the last few years there has been a big push for alternative energy sources. This push has lead to a great many solar-powered gadgets which promise to provide energy by harnessing the power of the sun. While that’s all good and well, there are situations where a solar panel isn’t going to be all that useful. 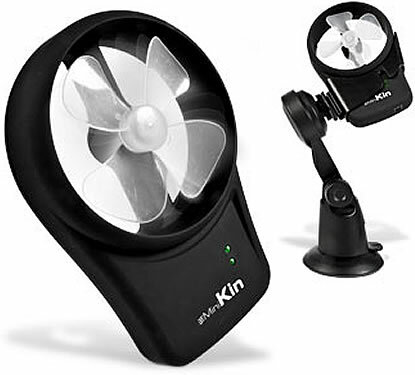 However, if you can generate a bit of wind, you could always use this Mini Kin Green Power Generator. This little device can be strapped to just about anything (they suggest a bike, your arm or even your dog) and will generate power when air flows through it. This energy can then be used to charge just about an gadget that uses a mini USB port. Sure, it’s not enough to cut your electric bill by any significant amount, but every little bit helps the environment. If alternative energy is your thing, then you can pick one of these up for around $50.